I wanted to give you a heads up on a potentially even more devastating invasive plant that I have seen in Upper Purgatory and on the edge of the upper portion of the Spring Lake Preserve: Star Thistle (both the Yellow and Malta variety are present in the area). This is a highly invasive and drought tolerant plant. It is toxic to horses and very painful to trail users. In the past year I have seen it spread from a few isolated plants along Post and Stagecoach roads, to the fringes of open areas in town, and becoming well established in disturbed areas. At the Craddock Rd / RR12 extension site, it is now covering approximately 40% of the fields. This is not a plant invasion to take lightly. It is the plant equivalent of the fire ant, but worse. In many parts of California, it has gone from an occasional nuisance, to the dominant plant. If allowed to go to seed, they are viable for a decade. I have attempted to get the state and county interested in early control, to no avail. I’m attaching some links to more information and pictures of the plant. It is in the Upper Purgatory parking lot area, and is established near the power substation and new apartment construction at the upper edge of the Spring Lake Preserve off of Ramsey St. I encourage you to help increase the awareness of this issue! The best control method is removal and bagging, but this is only feasible at the early stages of establishment. After that, grazing (by sheep and goats, NOT horses) and chemical control work, but they are long term control methods, as the seeds are viable for years and we need to be very careful about chemical application in aquifer recharge areas. Mowing is a [possible] remedy IF TIMED PROPERLY, if not it will just spread the seeds. 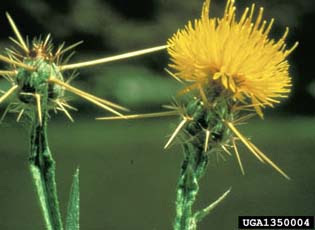 SMGA is not aware of any effort in San Marcos to control the Star Thistle, in fact, we think this alert from Jesse is going to be the first notification for most people in San Marcos. Here are the links he provided to help inform.